A few weeks ago, Eating Amsterdam reached out and asked if I would like to join in on one of their food tours. Typically, I would not think to hop on a food tour in my own city – I’ve been forking my way around Amsterdam for the past five years, and by now I’m well acquainted with all things edible and Dutch, ranging from raw herring to my beloved stroopwafels. 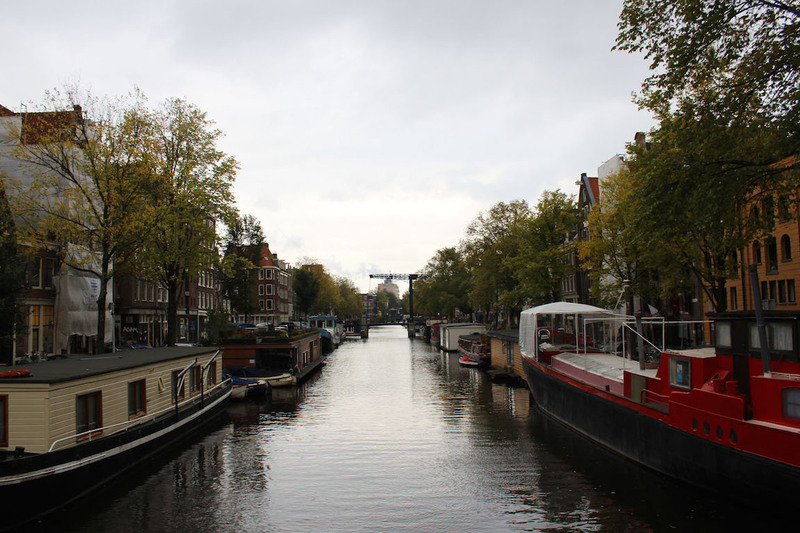 However, when I checked out Eating Amsterdam’s website, I noticed that they had a Jordaan Food Tour, which sparked my interest, as I’m not nearly as familiar as I’d like to be with the food scene in the Jordaan. 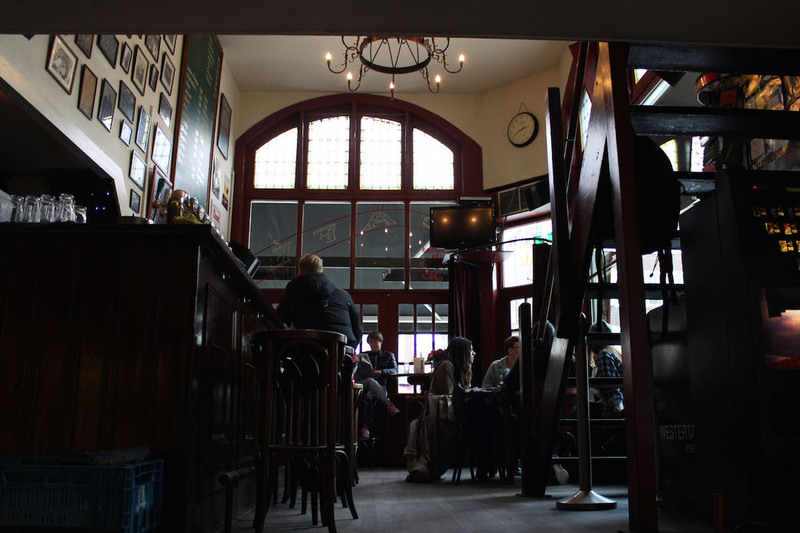 As a de Pijp local, I thought it would be fun to discover the culinary gems of another neighborhood. Fast forward a few e-mails, and I’m booked into Eating Amsterdam’s 4-hour Jordaan Food Tour, featuring a guided walk through the Jordaan neighborhood and a substantial meal in the form of a dozen delicious Dutch tastings. On the day of the tour, we met in front of Cafe Papeneiland at noontime. 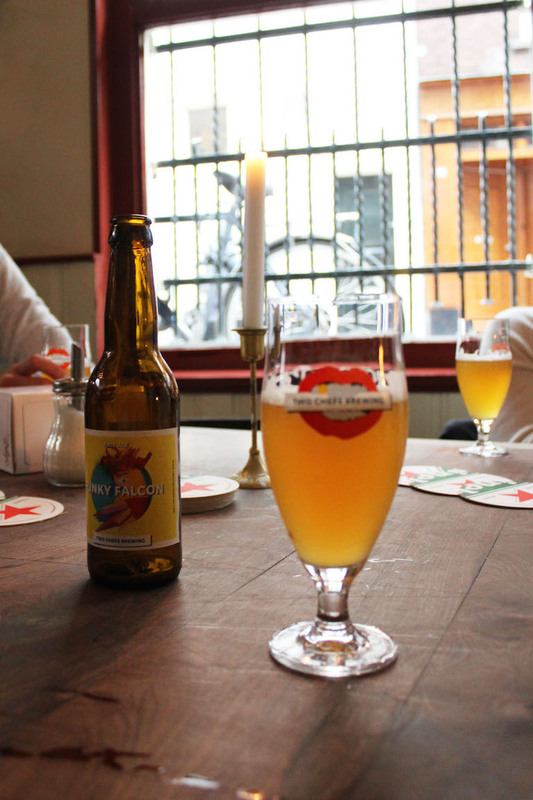 The Jordaan Food Tour consists of 12 food tastings (!!!) so I had a mere black coffee for breakfast, and arrived at Cafe Papeneiland with an excited, rumbling stomach. 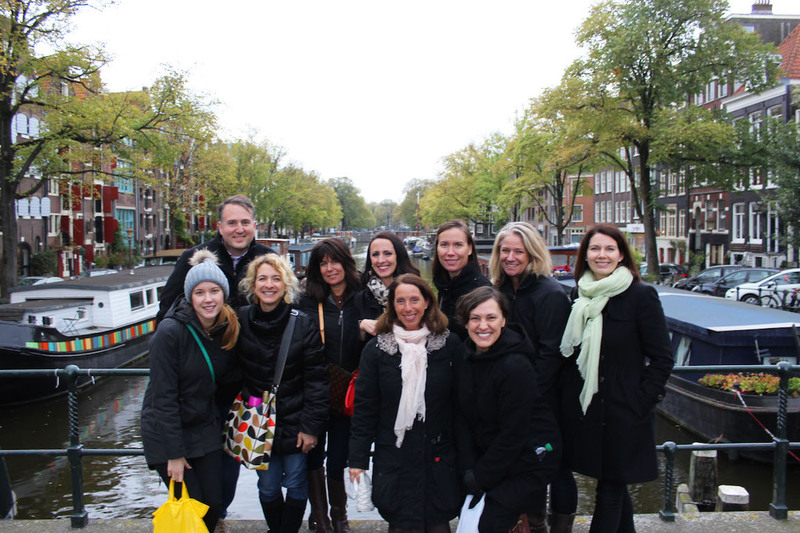 I was joined by a group of 8 lovely ladies from The Hague, and one gentlemen from Seattle who had just arrived in Amsterdam that morning. We were all introduced to Jelte, our tour guide, who kicked off the tour with a round of hellos and a stroll past the Noordermarkt. Our first stop was at Café de Prins for poffertjes. Poffertjes are akin to American pancakes – they’re soft and fluffy, served best with butter and powdered sugar. 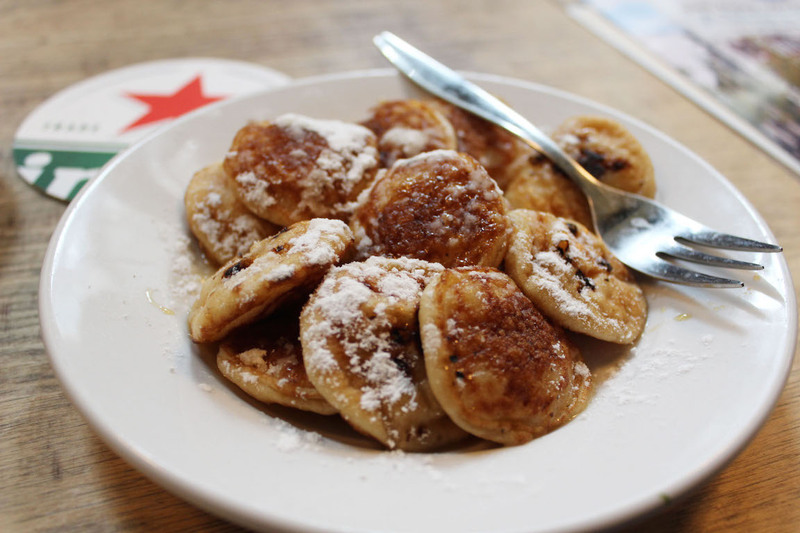 However, unlike American pancakes, poffertjes have a lighter, spongy texture. Eating a poffertje is like kissing a marshmallow cloud, smothered in delectable butter. They’re delicious and deadly, designed to plop into your mouth in a single, heavenly bite. Our next two stops were slightly less sweet, but equally enjoyable. We first walked to Butcher Louman, where we tried two different varieties of sausage. Louman’s was established by the Louman family in 1890, and the business is still family owned and operated today. The food quality is exceptional, and the sausages we sampled were delicious. 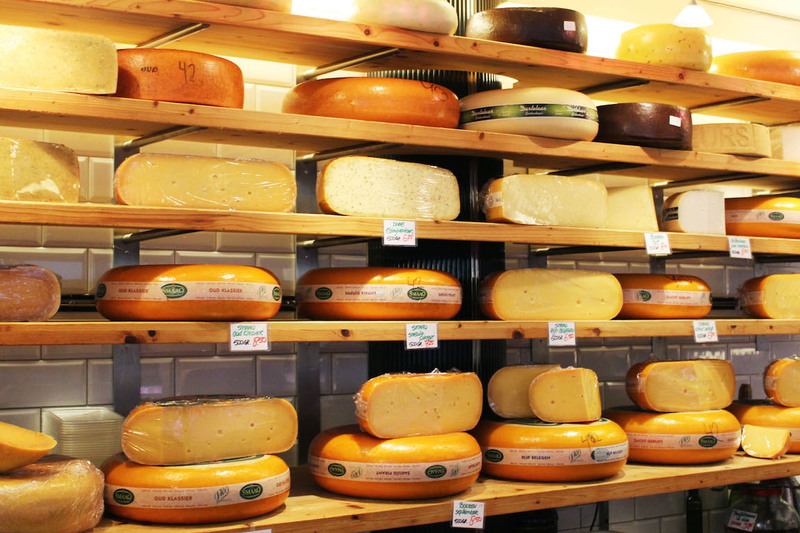 Next on the tour was a complimentary cheese stop at De Kaaskamer, where we tasted several varieties of gouda cheese. I did not realize that there were so many varieties of gouda, and the aged farmhouse gouda is a new cheesy favorite of mine. After indulging in cheese at De Kaaskamer, we walked over to Swieti Sranang, where we sampled some of the best Surinamese and Indonesian food in Amsterdam. I’ve actually walked by Swieti Sranang on many occasions, without giving the small, inconspicuous shop a second glance. However, the deep-fried plantains with peanut sauce we sampled were exquisite. The afternoon was drizzly, and we were pleased to hear that our next stop would be at an adorable brown bar, where we could relax and sip tea for a bit. 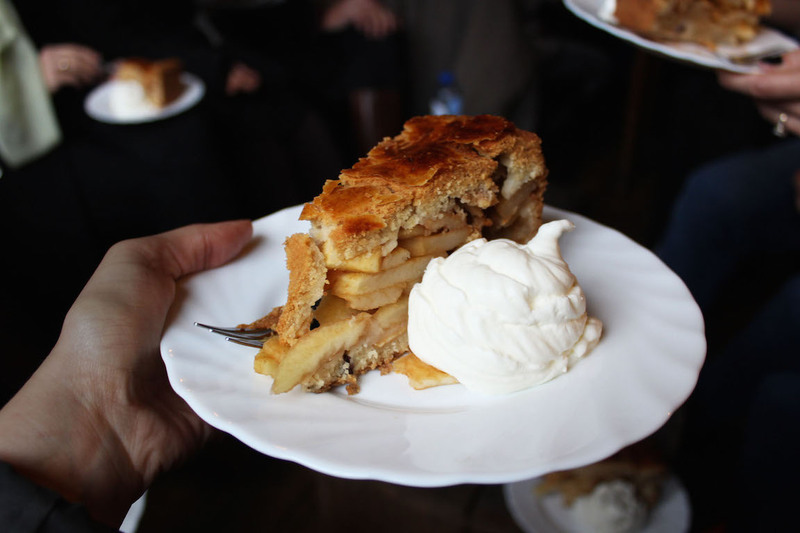 And what goes better with tea than a delicious slice of Dutch apple pie?! 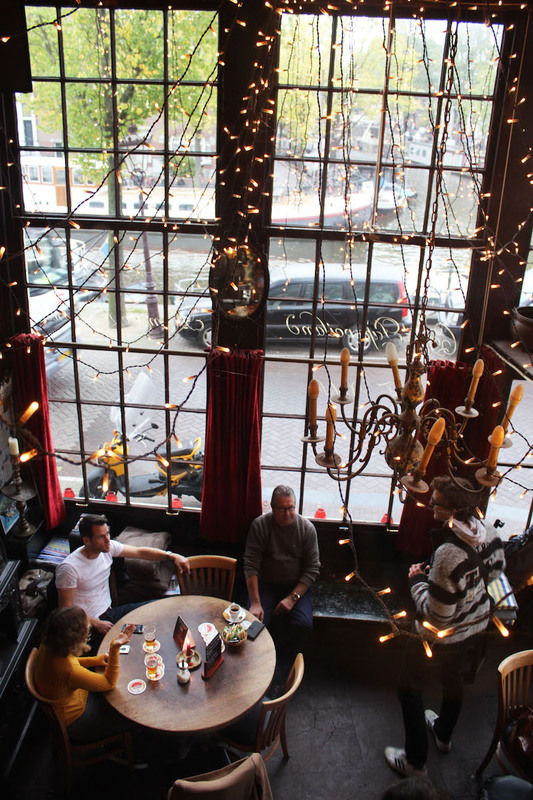 Café Papeneiland is one of the oldest cafes in Amsterdam, particularly known for their mouth watering apple pie. At one point, Bill Clinton famously came here for a cappuccino and a slice of apple pie – and he ended up taking a whole pie to go with him!! 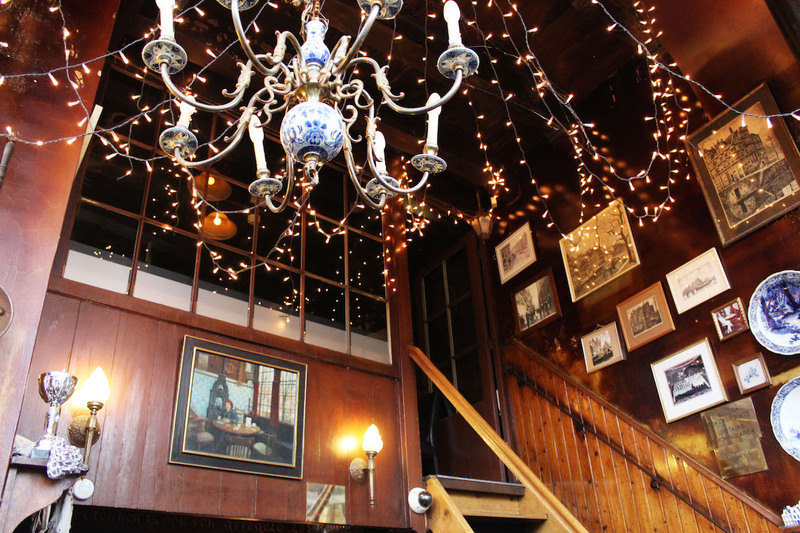 We dug into our pie in the cozy atmosphere, surrounded by fairy lights and chandeliers. 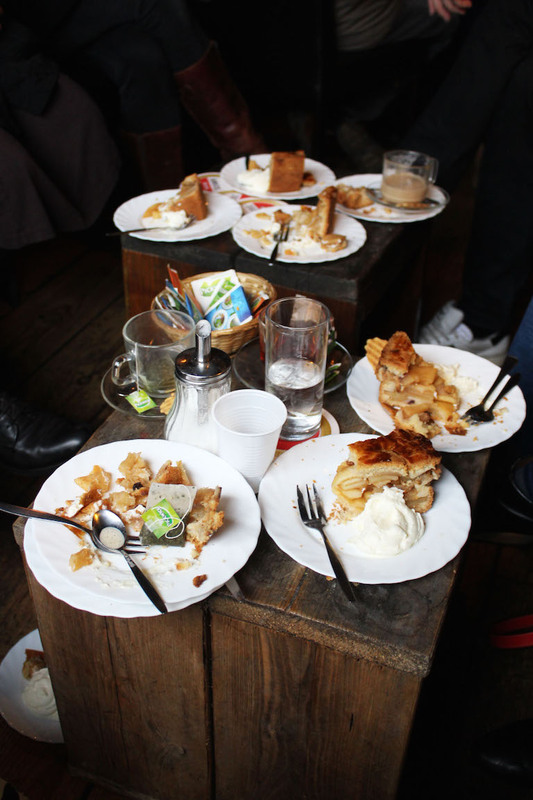 Although the pie was delicious, we had reached a point in the tour where eating was a struggle. I had hungrily scarfed down the food at our first four stops, and my stomach was at 80% capacity! 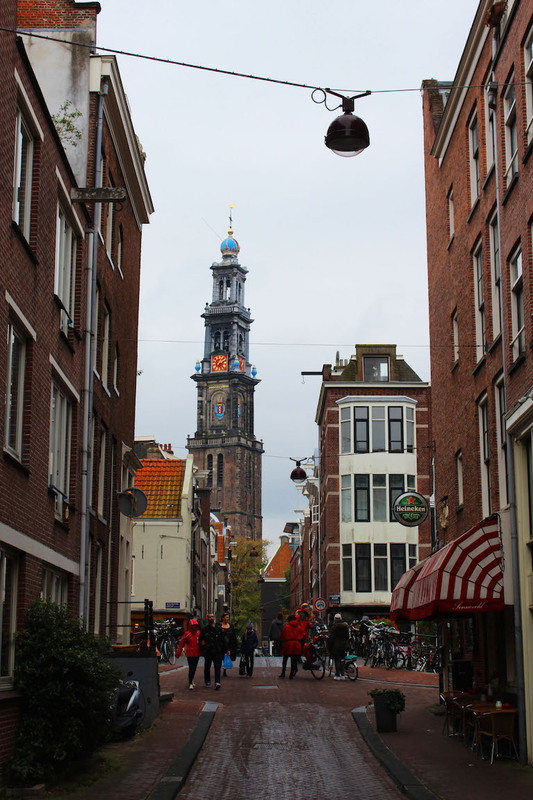 With half the tour remaining, we finished our tea and most of our pie, and hit the streets once again to explore more of the Jordaan. Our next stop was one of my favorites. We popped into Vis Plaza, and I knew right away that it was time to sample some raw herring. However, on this occasion, we eased our way in to the Dutch delicacies, starting with some kibbling (deep fried battered fish pieces), only then followed by an equally large platter of raw herring with pickles and onions. Quite a few of the ladies on the tour did not fancy the raw herring (and I don’t blame them!) but over the years I have developed a taste for raw herring – and so their loss was my gain!! Any room left in my stomach was filled with herring and pickles, making me officially stuffed for the remainder of the afternoon. Unfortunately for my stomach, our next stop was dazzling. 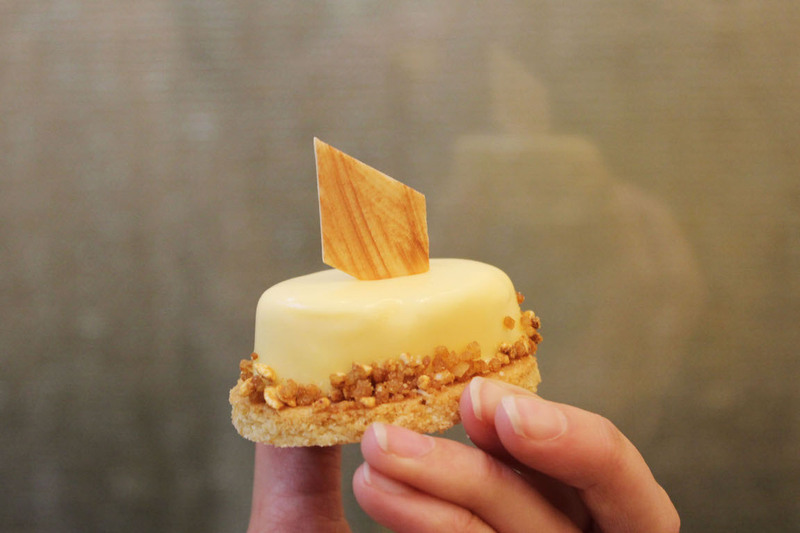 We popped inside a small, adorable patisserie, where we sampled white chocolates filled with advocaat, a traditional Dutch alcoholic beverage made from eggs, sugar and brandy. Buzzed on sugar, we marched off to our last stop of the day . . . crossing over some beautiful canals . . . . . . and stopping for a lovely group photo. We entered Café de Blaffende Vis quite stuffed, but excited to sample some ‘borrelhapjes’ or in English, snacks! We were treated to a local beer (yum!!) and another Dutch favorite of mine, bitterballen. Bitterballen are an acquired taste. Filled with a thick, molten roux, these breaded bar snacks are served hot and typically with a side of mustard. 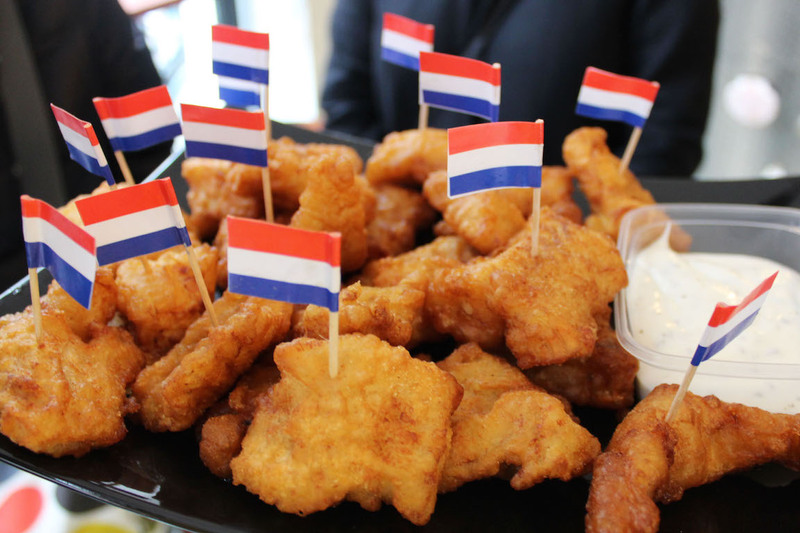 Best accompanied by beer, bitterballen are the Dutch equivalent of mozzarella sticks or potato skins. They’re a social side dish to share with friends, a little something to tide you over until dinner or while you watch the game. You wont realize that bitterballen are missing from your life until you try them . . . and once you do, there’s no going back! Overall the afternoon was a delight. Jelte our tour guide was fantastically knowledgeable and the food was amazing. I’d highly recommend the tour to those with a taste for all things Dutch, foodies visiting Amsterdam, or locals who simply want to explore a new neighborhood. 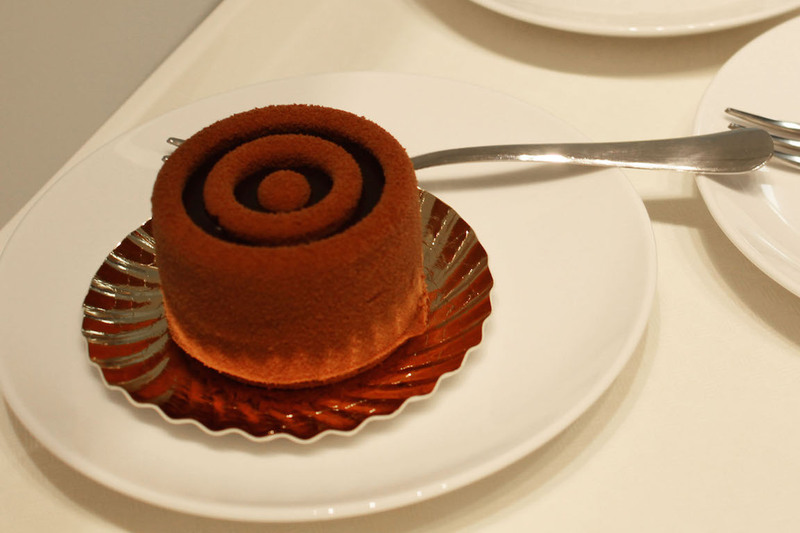 You can find more on Eating Amsterdam Tours here. I nominated you for a liebster award, thanks for your awesome writing! Interesting article! I don’t really come to Amsterdam for local actually because it’s spread out mostly in small towns. Good tour you just made there. Thank you!! I’m yet to find bitterballen anywhere outside of Holland! Great photos. Now wondering where I can find bitterballen in the US! Food tours are so great! Sounds like a good time And a lot of time in the bathroom later. Hah! I’m going to Amsterdam in May and will definitely look into the food tours. Glad to help Mel :) Enjoy your time in Amsterdam! Seeing all the fun you were having and posting beautiful photos, it makes me want to jump on the plane and travel. :D I could only wish.